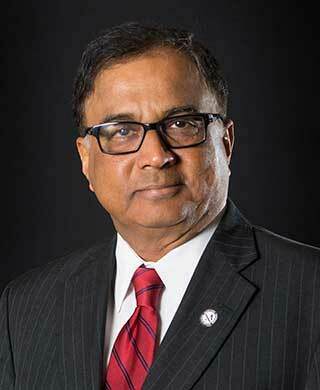 Dr. Vilas A. Prabhu is Provost and Vice President for Academic Affairs for Millersville University. Reporting directly to the President, the Provost oversees the Deans of the four colleges as well as the University’s planning process, all academic programs and curriculum development, plus related support services such as assessment and budgeting. The University Library and University Honors College also report to the Provost. Dr. Prabhu is responsible for leading the Division of Academic Affairs to fulfill Millersville University’s vision to transform each learner's unique potential into the capacity for successful engagement in career and life opportunities. Under his guidance, Academic Affairs strives to provide undergraduate and graduate programs of distinction, grounded in the liberal arts tradition, and prepare students to be lifelong learners, civically-engaged citizens, and productive professionals in a global and diverse society. The Provost oversees the areas below, as well as the following faculty processes: appointments, development, evaluation, promotion, tenure and sabbatical leave. Through a culture of openness, continuous improvement and reflective assessment, the mission of the Provost and the Academic Affairs Office is to constantly enhance opportunities for students to grow intellectually, think critically, and develop leadership skills. Faculty, staff, students and community members collaborate on professional, scholarly and creative works that contribute to the health of our institution, our community and the Commonwealth of Pennsylvania.